© Desiree Palmen – All rights reserved. Palmen started camouflaging herself in front of surveillance cameras because she didn’t like looking at herself on the security cameras screen while waiting in line at the post office in Maastricht, Netherlands. “This annoyed me,” Palmen says. Soon after, Palmen painted herself to blend in with the post office’s interior, and brought a friend along to film the stunt with a hidden camera. That was 1999. 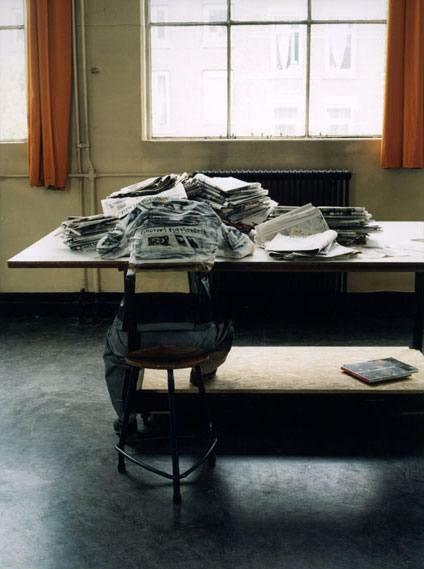 In 2002, Palmen launched a project called STREETWISE, in Rotterdam. 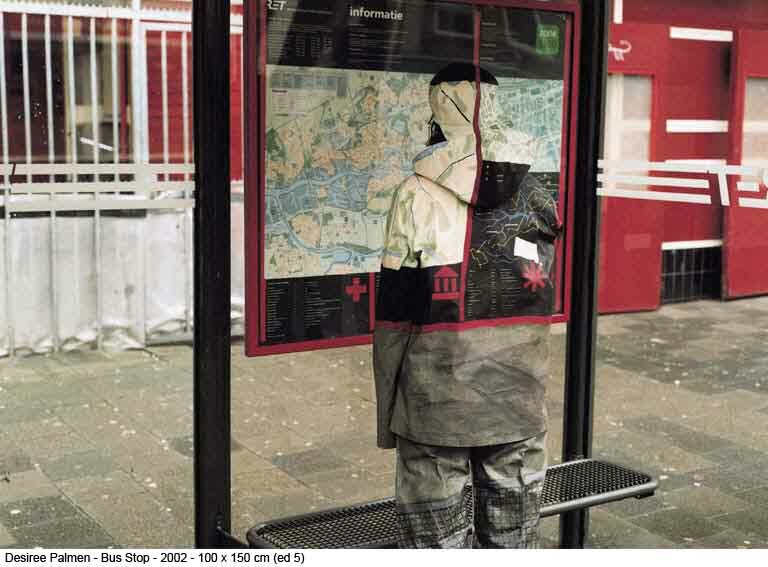 She would camouflage people to match a particular public scene that she had photographed, just as she had done at the post office in Maastricht a few years prior. The camouflaged individual—sometimes herself, sometimes a model—would always be positioned in view of a surveillance camera. She would then stand atop a ladder, hold out a camera attached to a stick, and take photos and videos of the model and their surroundings. “I directly addressed to the personnel that watches the cameras by trying to match up the painted camouflage costumes with their perspective, given by the mechanic eye of the surveillance cameras,” Palmen says. Since the painting took place at her studio, she often had to return to make color corrections or other tweaks if the costume didn’t perfectly match the background. Palmen’s intention was, in her own words, to “quest[ion] the monitoring of people in public space.” She felt she was making a comment to anyone monitoring the security footage about humanity’s innate desire to not be watched; equally, for passerby, the presence of the obscured model was intended to have a similar effect: to make them think about why they were being monitored, and whether or not it was necessary. Palmen’s interest in camouflaging models in urban environments also stemmed from a lifelong interest in science. “I always maintained a special interest in biology, in particular the strange forms and behavior traits exhibited by mimics within the animal and plant kingdom,” Palmen says. “I tried to apply these concepts in my artwork. 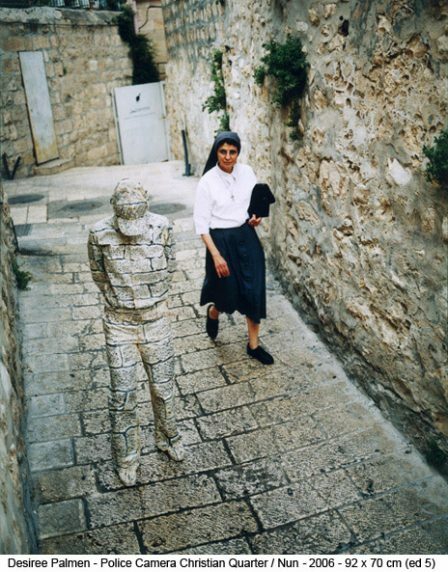 An exploration of human mimicry in urban environments using garments painted to resemble their background.” Her work shows how humans, like chameleons, might be able to blend in to the environments we created for ourselves. 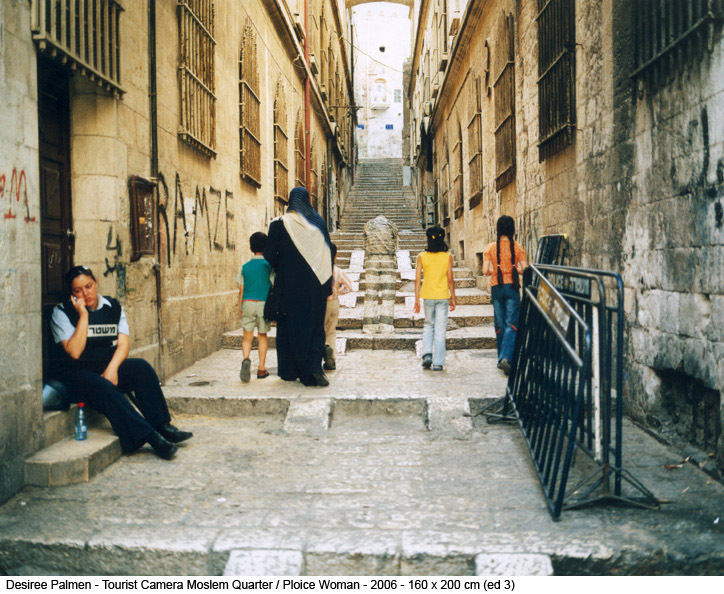 Palmen took a version of her STREETWISE project to Israel in 2006—this time, under the name OLD CITY SUIT—when she was invited by Palestine non-profit art organization the Al Ma’mal Foundation for Contemporary Art. By displaying the same type of work in public spaces of two very different countries, Palmen was able to demonstrate how camouflage can be used in various urban environments, and how the desire to blend in may be universal. The interactions between the public and the models during the STREETWISE and OLD CITY SUIT projects were, for the most part, positive. Palmen intentionally chose to carry out both projects in “so-called dangerous city areas,” but she experienced few problems aside from people coming up and asking how long she was able to stand in that position without moving or getting water. 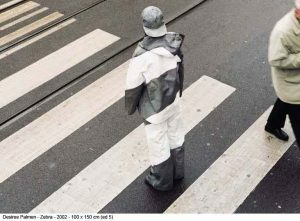 Her biggest threat came after painting herself gray and white in order to mimic the striped lines of a cross walk. “One person on a bike tried to hit me as I was standing in the middle of the zebra crossing, and cars were, of course, honking,” Palmen says. But, Palmen wonders if her work has made people question the use of surveillance as much as she had intended: “I think most people seem to think that surveillance cameras increase our safety,” Palmen says.